Church of the Holy Sepulcher, Jerusalem. Over Calvary. The large stones of the temple wall, thrown down by the Romans in 70 A.D.
Biblical teaching at Mount Precipice outside Nazareth, where people once tried to throw Jesus off the cliff. Renewing our baptismal promises at the Jordan River. 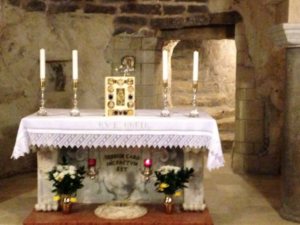 Mass in a cave in Bethlehem, similar to the one in which Jesus was born. We pray the 4th and 5th Joyful mysteries on the Southern Steps of the Temple, where Jesus, Mary and thousands of other Jews entered the holy place. Get a visual, Biblical tour of the ancient city of Jerusalem, following Christ’s footsteps during his Passion. Click HERE to download a Reservation Form. 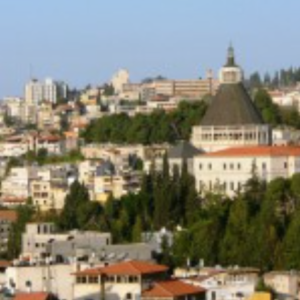 From Nazareth to Calvary, walk in the footsteps of Mary and Jesus in the Holy Land. 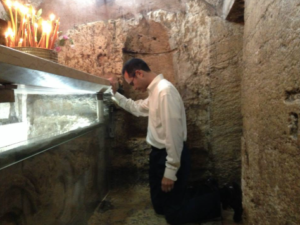 In this pilgrimage, Dr. Sri prayerfully considers the life and mission of Jesus Christ and offering offers Biblical teaching at each of the holy sites. The 20 Mysteries of the Rosary serve as an outline for the itinerary and help us “keep and ponder” the mysteries of Christ’s life with Mary. 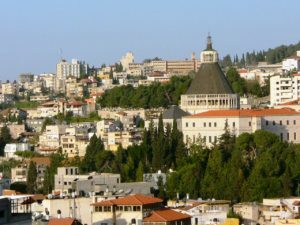 Go to Nazareth, Ein Karem and Bethlehem to pray at the places where the Annunciation, Visitation and the Nativity took place. Visit the locations of key moments in Christ’s public ministry such as Cana, the Sea of Galilee, the remains of the first century synagogue in Capernaum where Jesus taught, the mount of beatitudes, and the traditional location of the multiplication of loaves and Mount Tabor to recall the Transfiguration. The pilgrimage culminates in Jerusalem, where we will visit the Cenacle (the upper room which commemorates the Last Supper and Pentecost), the Mount of Olives, and the Garden Gethsemane. We will walk through the streets of the old city of Jersusalem on the “via dolorosa”—the way of the cross—culminating in a visit to the Church of the Holy Sepulcher, where we will pray at Calvary and the tomb of Jesus from where he rose from the dead. To round off this pilgrimage with Our Lady, we will visit the places in Jerusalem believed to be where Mary’s fell asleep and was assumed into heaven to be crowned as Queen in her Son’s kingdom. We anticipate visiting other sites in Israel related to the Bible such as Elijah’s Mount Carmel and Caesarea Philippi where Paul was imprisoned and shipped to Rome. At each site, Dr. Sri will offer Biblical teaching about Mary and about Jesus’ public ministry. We also will provide historical background and prayerful reflections related to each site to help us enter spiritually into the sacredness of every location. In this Marian-focused pilgrimage, Dr. Edward Sri is offering a special small group pilgrimage with spiritually focused reflections born from filming in the Holy Land and years of experience teaching and writing on Scripture, Jesus and Mary. Traveling in a small group you are able to enter into the spiritual significance of each site in a more profound way. There will be a prayerful environment, Biblical teaching on each site and time for fellowship together, including Q&A time and meals with Dr. Sri and the chaplain. Due to the small size of this particular pilgrimage, spots are likely to go quicker than on other pilgrimages Dr. Sri has led. Reservations will be granted in the order in which deposits are received. “Hail, full of grace….” (Annunciation) Discover the powerful meaning of each of Gabriel’s words to Mary–and Mary’s response–right at the place believed to be Mary’s house in Nazareth, where the angel appeared to her. “Blessed art thou among women” (Visitation). Pray the magnificat in the beautiful hill country of Judea where Mary originally spoke those words during her visit to Elizabeth. The beautiful hills surrounding Nazareth. The Son of God, in his humanity, lived amid this terrain and rejoiced over the work of his own creation. 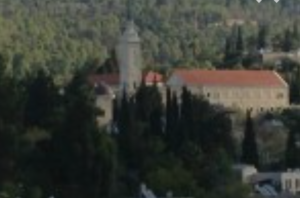 “A woman clothed with the sun…” (Assumption and Coronation) – Mary’s resting place in Jerusalem from which Mary is believed to have assumed into heaven.